Perkins Woods, a suburban forest preserve in Cook County, is seven acres of heavily wooded land where wildlife, migratory birds and citizens of Evanston, Illinois come together. Serving as the romping ground for people of Cook County who want to enjoy the serenity of nature without traveling too far, Perkins Woods is enjoyed by many. So many people, in fact, that the existing asphalt trail had become dilapidated and deteriorated over time. Worn, cracked and crumbly, the path had grown to be a hazard to those trying to walk through the woods. The debate over how to replace it, though, grew to be bigger than just deciding whether or not to replace the five-foot-wide problem path. Residents argued over whether to replace the asphalt trail with a larger 10-foot-wide concrete path or a more natural crushed granite trail. After heavy pushing from a small group of residents, it was decided that a smaller granite path, which could allow water to seep through while retaining a natural look and feel, would only enhance the beauty of Perkins Woods. 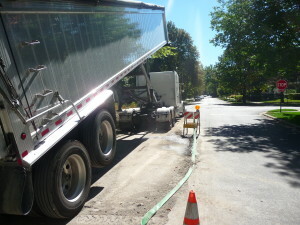 The material was delivered to a nearby side street, where the aggregate was then pre-hydrated using a water truck and skid-steer. WHEN: October, 2013. As all stabilized pathway projects, the material had to be installed before a freeze cycle occurred. WHERE: Evanston, Illinois. One square block of heavily wooded land. WHY: The existing five-foot-wide asphalt path had broken down with use and over time. Perkins Woods is an especially damp and wet area as well, and the culverts beneath had been silted in, causing further deterioration to the path due to standing water and lack of drainage. WHO: Century Contractors was chosen to remove the old path and install the new one. Paul Williams of Williams Design Group was volunteering as part of the Perkins Woods Steering Committee, and was instrumental in selecting the material and designing the new installation. Although it was their first time working with Kafka, Williams and the Committee knew it would be an ideal match as they had seen Kafka’s crushed granite used nearby at the Ladd Arboretum in Evanston. Century Contractors installed the new pathway. Working space was tight as they wound through the forest preserve. 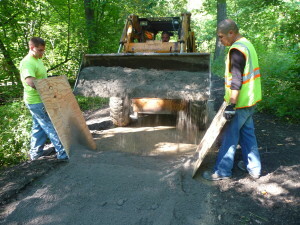 Both Kafka sales representative Dan Steidl and members of the Cook County Forest Preserve were on-site during the installation of the path. Kafka Granite sends sales representatives to job sites when possible to aid with installation. 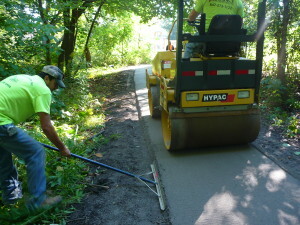 Funding for the new path came from the Cook County Forest Preserve, which also came to observe installation. It was great to have them at the job site so they could see how poor the existing path was and how much of an improvement the new path would be. WHAT: The Cook County Forest Preserve chose to use Kafka’s Pewter Granite-colored Organic-Lock stabilized pathway. Installed at a three-inch depth, this is an all-natural pathway. The color of the crushed granite complements the natural tones and hues found within the woods while the improved permeability of the crushed granite when compared with the old asphalt path would help the surrounding soil and plants. Water pooling during heavy rain was also a problem that existed with the asphalt pathway. The stabilized pathway with Organic-Lock stabilizer would minimize pooling, redistribute that water to surrounding land and could remain non-slip so to ensure the safety of nature-seekers who might get caught in the rain. And when installed correctly, Organic-Lock stabilizer is compliant with the Americans with Disabilities Act; so although the pathway is natural, it’s completely wheelchair accessible. 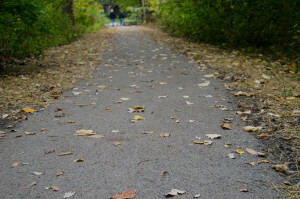 Kafka’s crushed granite stabilized pathway served as the perfect and natural alternative to the previously obtrusive and non-permeable asphalt path. The designer chose a natural edging option, to allow the path to blend with its surroundings. HOW: There were several hurdles to jump during and after installation of the Perkins Woods walking path. The first issue addressed was how to dampen the material. The Organic-Lock binder has to be “activated” — activation of the stabilizing binder happens by mixing it with water. This process has to happen in a location where the pathway mix won’t become contaminated with dirt, leaves or other debris, making activation in the middle of the woods impossible. A solution was found by mixing the stabilized pathway mix outside of the woods on a nearby side street with the help of a skid steer and a water truck. Another issue arose soon after installation of the path. Perkins Woods has above-average moisture levels, extending the cure time of the stabilized pathway. While not yet cured, a tree-trimming group had driven a vehicle onto the path, disrupting it and causing minor damage. The completed path is now enjoyed year-round by local residents. Working well with the contractors, Kafka’s recommendation of investing in an extra super sack of the Pewter Stabilized Pathway Mix was acted on. After scarifying the surface of the damaged area, the extra pathway mix was blended with water to activate, leveled and compacted over prepped areas of the pathway. After a proper cure time in the environmental conditions of Perkins Woods, the new pathway can withstand the weight and abuse of nature goers and vehicles, and the Cook County Forest Preserve is happy with the completed pathway. Instead of opting for a large and obtrusive concrete pathway, Kafka Granite helped Perkins Woods find a pathway that complements the natural essence of the land by both its aesthetic value, and its ability to allow water to drain instead of pool and deteriorate the path. With proper maintenance, the Cook County Forest Preserve and the residents of Evanston can enjoy this natural pathway for many years to come.